Flobot's scheduling system makes it simple to book jobs and appointments into diaries for field based engineers, Field Service Operatives, contractors and employees - basically anyone who needs to be somewhere at a certain time. And just as important, it makes it easy to keep your customer informed too. You can send the appointment to them by sms text message or email - they can even see it in their own portal. Book an individual or a team to do a job. Make a recurring appointment that occurs at the same time every day, week, month or even year. 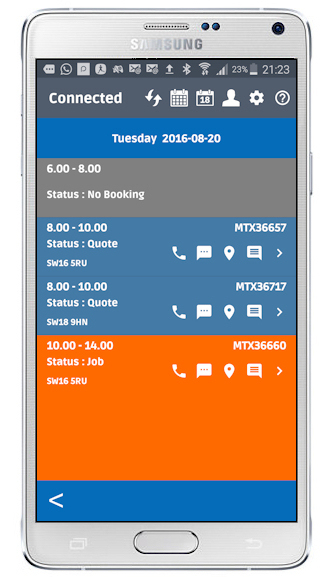 Block out contractors and employees for training, holiday or anything else and show it all in the colour coded diary. The schedule or diary gives you control and visibility of what your business looks like ahead of time - and what it looked like in the past for that matter. An appointment will appear in the diary on the app for the field team member or contractor and of course, they can access the app from a smart phone or a tablet anywhere. The field team can navigate from job to job by utilizing the built in maps function. They can send that information to your client and the client can see where your field team is on the map with an estimate of the time of arrival - just like Lyft. As someone working outside the office it is super simple to see who you are seeing next and where they are located. All the information you need is in your diary app. Most of the time the office will want to create an appointment for any follow on work but if you want the field team to make those appointments themselves the app gives everyone visibility of their diary so they can discuss it with the client and do it there and then. Flobot app sends all the field data back to the office so you can see where all your field members are and what they are doing at any time - where they are and where they should be. The right people in the right place at the right time. 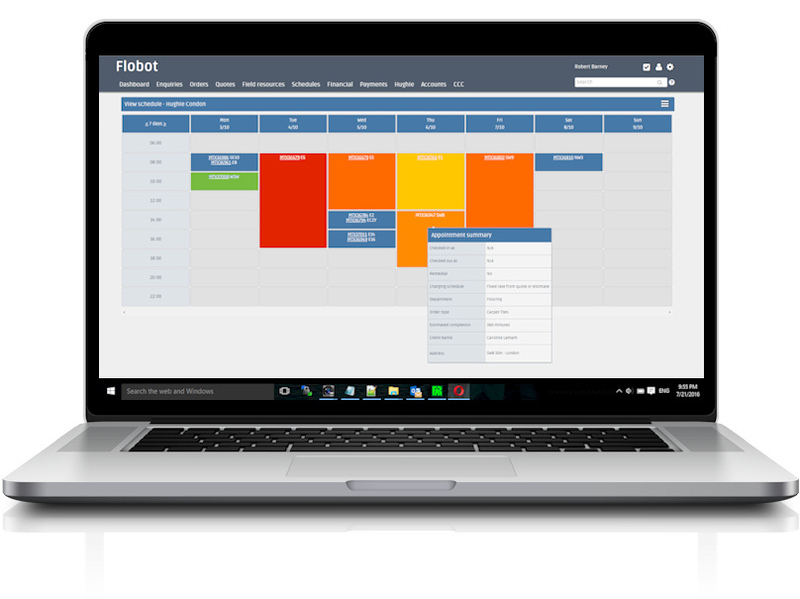 Flobot enables you to schedule your field team in real time while your customer is on the phone, eliminating the need for you to spend hours building schedules to work out who to send where. When a customer requests a specific type of job, Flobot presents only the field team members who are capable of fulfilling that job and who cover that area. It means you always send the right field team member to the job - every time. Your team members can instantly see updates to their schedule either on a tablet or by logging in to their own portal where they'll see detailed information of their schedule, along with quotes they've prepared for you, statistics on their work rate and lots more. If you subcontract work, you can eliminate calls into the office about payments, quotes and completed jobs by referring your subcontractors to go to their own portal. It's a great way to keep everyone fully informed while saving valuable administration time. As soon as you've created an order for your customer they'll be sent a customised welcome e-mail along with appointment confirmations and even an SMS Text message. Your customer now has a copy of the time your engineer will arrive and a reference number to make sure they are there to receive them. It's these small but vital pieces of information that will enhance your customer's experience and keep them coming back to do business with you. Field team members who are using the Flobot Field App can complete electronic job sheets allowing them to capture not only descriptions of the work they've completed, but include images, recommend follow on work and capture electronic signatures - even off-line. Best of all, once the electronic job sheet has been completed everyone can view the data live in real time. No more waiting for job sheets to be dropped off at the office. Whether you're in the office or in the field, you can pull up today's schedules so you can see exactly where your field team will be and what they will be doing. With Flobot you can manage an unlimited amount of field team members and see their progress throughout the day as they check and out of jobs. Thanks to Flobot Field App's geo-location capabilities, you can even see where all of your engineers are on a live map and that means no more phone calls to check where your people are.